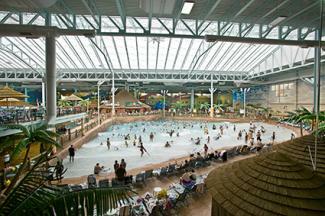 No matter the weather outdoors, it's always warm, wet and wild at an indoor water park. From the climate control to the mixture of water slides, amusements, games and quiet areas for adults to relax while their kids frolic, these resorts offer a great escape anytime of the week or year. Discover the best indoor water parks for your vacation fun! Whether you are looking to get away for a day or a week, these indoor water parks offer you year-round access no matter the weather outside. 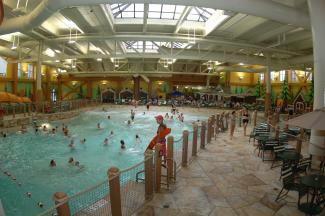 With multiple locations around the country, Great Wolf Lodge is among the best-known indoor water parks. The cream of the crop is the Wisconsin Dells location, where one of the top attractions is the Howlin' Tornado, a six-story water funnel that drops riders into a pool below. The majority of visitors rated this park as "very good" to "excellent" for families on TripAdvisor. The Travel Channel places the entire chain of Great Wolf Lodge parks at the top of its list of indoor water park winter getaways. See Staying at the Great Wolf Lodge to learn more about this park, as well as the chain's other locations. Sahara Sam's offers a family-friendly getaway any time of the year. 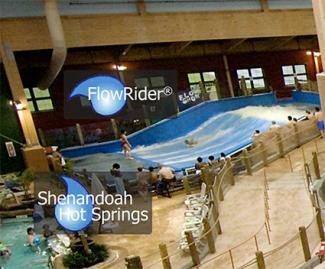 The indoor surfing simulator Flowrider is one of the most popular attractions at the West Berlin water park. Locals can enjoy season passes and out-of-town visitors can earn a discount with Sahara Sam's stay and play deals at local hotels. Visitors left reviews at TripAdvisor describing the indoor park as a great place for escape in the winter, as well as a good choice for a whacky day of weekday fun in the summer. Sahara Sam's is rated number two on the above-mentioned list of the Travel Channel's top indoor water parks to visit. Located very far north, H2Oasis earned its place on this list by being the only water park in Alaska. Set at 84 degrees year round, the escape from the state's subzero temperatures includes a wild ride on the 42-foot long Master Blaster. This is a water coaster that ends in a splash-down pool. Other attractions include a lazy river, a wave pool, and a pirate ship for the kids to play on. Reviews on TripAdvisor are mixed, but fans found the park to be a perfect escape. This northern oasis rated in the the same Travel Channel list previously mentioned. Popular rides like the Rip Zone surfing simulator and the Splasherhorn water coaster give visitors a reason to visit Michigan's Avalanche Bay time and again. Families enjoy the multiple events, local hotels, restaurants, and spa. Visitor reviews call out the economical price and the activities available to kids of all ages as the biggest reasons to visit. The indoor water park was rated the number one water park in the U.S. by the Huffington Post. This African-themed water park is open year round and features a large number of rides. One of the most popular rides is the Zip Coaster, which is a tube rider's dream of thrilling climbs and heart-pounding drops. In addition to play areas for little kids, visitors can enjoy cabana rentals and more. The adjoining resort is perfect for out-of-town families or locals seeking a night away from home. On TripAdvisor, visitors called the park a great escape for the family, referring to it as a perfect day trip because of the staff and the rides. This northern oasis rated in the Huffington Post and Travel Channel lists of the top indoor water parks in the U.S. Discover Texas's Schlitterbahn Galveston Island Waterpark, an indoor and outdoor water park. 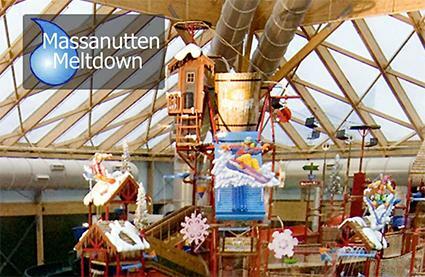 Wasserfest, which is the indoor portion of the park, provides five acres of watery fun for visitors. Attractions include open and closed inner tube slides, speed slides, multiple children's play areas, a tidal river and an 1,100 square foot hot tub with a swim-up bar. The majority of visitors rated the park awesome on TripAdvisor. It's a particular favorite for spring breakers, who visit during a time that Texas weather can be fickle. Budget Travel rated Schlitterbahn the number one U.S. indoor water park destination. Schlitterbahn Galveston also earned a number two indoor water park rating by the Huffington Post and was named number one in Texas by USA Today. Considered one of North America's largest indoor water parks, the World Waterpark is actually attached to Canada's West Edmonton Mall and its 800 shops. The park includes a thrilling funnel slide and a strobe-lit tube ride down an enclosed slide. The highest slides are 83 feet high. The park occupies five acres and can accommodate over 40,000 guests. The majority of TripAdvisor ratings are "very good" or "excellent", although some visitors recommend avoiding attending on Fridays, when the facility seems to be most crowded. 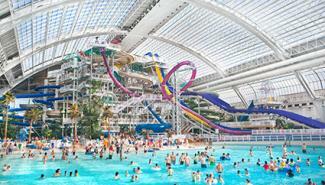 Complex City Guide rated this park number three on its list of the top 15 craziest indoor water parks in the world. Located in Virginia's Shenandoah Valley, Massanutten Resort is a 42,000-square foot park that has rivers with waterfalls and spray features, kiddie ponds with tiny slides, swings, and more. 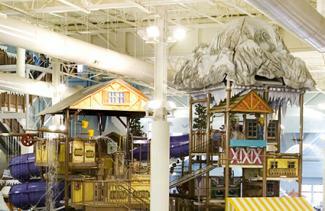 Other nearby attractions add to the desirability of the indoor water park for family vacation planning. Tots and Travel lists this park as one of its top ten for families, particularly those with young children, for both the amenities and the accommodations. It's also included on the Huffington Post's list of top water parks. Minnesota residents and visitors will delight in the Water Park of America situated right next door to the Mall of the Americas in Bloomington. 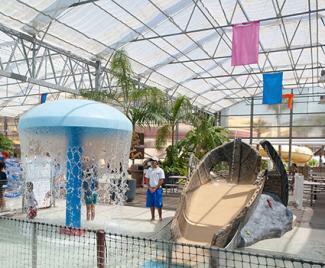 The water park relies on a rugged outdoor theme and provides adventurous swimmers with a surfing simulator, wave pool and ten-story family raft ride. For a more relaxing time, drift down the lazy river, play water basketball and enjoy Fort Snelling, a play area that includes drenching buckets of water for the unwary. Visitors reviews are mixed, particularly at the busiest times of the year. As it's attached to one of the largest malls in the country, it's no wonder that this park can get quite crowded. The 65,000-square foot water park's great attraction is the Hurricane Vortex thrill ride. It shoots raft riders 40 miles per hour down a swirling bowl and then over a 44-foot plunge. Other rides include a wave pool where visitors can ride their tubes or floats, a heated water pool just for adults, and a play area where little kids can splash and play on shorter slides and water rides. The resort includes a spa for kids, as well as dining and entertainment. The decorations are colorful and fun. Visitors overwhelmingly rate Key Lime Cove high on safety and fun, but many visitors mentioned the beds in the rooms were too hard for their comfort. This colorful water park rated number one for families by the Chicago Parent. Open year round, indoor water parks are an ideal destination when kids go stir crazy in the winter or you want to escape the brutal sun and heat in the summer. With so many locations across the country, you're sure to find one in driving distance. Whether you're planning a water vacation or checking out your vacation destination for other adventures, indoor water parks are good stops for short and long stays.